Gold The lovely play of light of the golden blades of astrophyllite cheers the heart and lifts the spirits. It subtly warms, strengthens and energises from within, more as if it were a glowing coal, rather than a wildfire. It can balance when fire is lacking (in TCM and Ayurvedic terms), without increasing heart rate, blood pressure or anxiety, and helps us to be gently but fully present in the physical body. Astrophyllite facilitates self-reflection, helping us to examine the trigger or root of conflict with others from within ourselves; to look at own our part and take responsibility, so we are able to resolve the issue, shift our consciousness, and learn from the experience. It can help us become aware of misdirected energy flow in the body, and redirect and balance our energy. 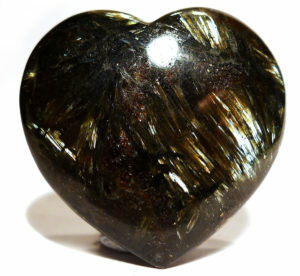 Physically, astrophyllite works on a cellular level, strengthening cell structure and regulating cellular fluid, as well as supporting nerve function. Deep Blue There is no mention of this colour in any mineralogy books or on MinDat. It originates from Russia (via China), and does not appear to be available in its raw form – so there is a question as to whether or not it is actually astrophyllite, or another related mineral. Blue astrophyllite grounds, calms, and aids communication – this is particularly helpful in children with learning and behaviour problems, such as ADHD, where a calm approach and facilitating communication is key. It has also shown itself useful in treating other brain dysfunction, particularly when there has been an interruption to the synapses, such as in cerebral palsy or other forms of brain damage. Recently I’ve been holding two small tumbled pieces on either side of the head with a number of clients, to rebalance brain activity when one hemisphere feels more active or ‘hotter’ than the other (this imbalance fairly common, and probably due to excessive use of computers and mobile phones). It seems to have a remarkable effect. 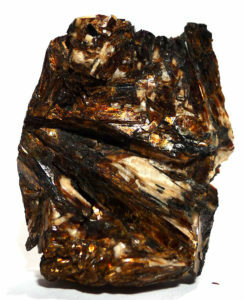 Astrophyllite is also used to treat glaucoma, usually by holding it at the temple nearest the affected eye. Astrophyllite usually occurs as bladed crystals, which radiate from a common centre (stellated). It forms in cavities in alkali-rich granites, syenites, syenite pegmatites and gneisses. In its raw form it resembles mica, and when polished can bear a similarity to nuumite. Mineralogy books and MinDat describe the colour as golden-yellow to brown, but there is polished material coming out of Russia via China that is deep blue, and which is marketed as astrophyllite. Named in 1847 by Ernst Friedrich Glocker for its composition, from the antiquated term “arsenical pyrite.” Arsenopyrite, as a name, may be taken as a simple translation of “arsenkies”.